Wish our political parties were as keen and together to curb down corruption and scams and to defend the nation from terrorists,Pakistan and China !!! well.. dear Pritam.. i pity , in the first place .. why was constitution made the way it is !! 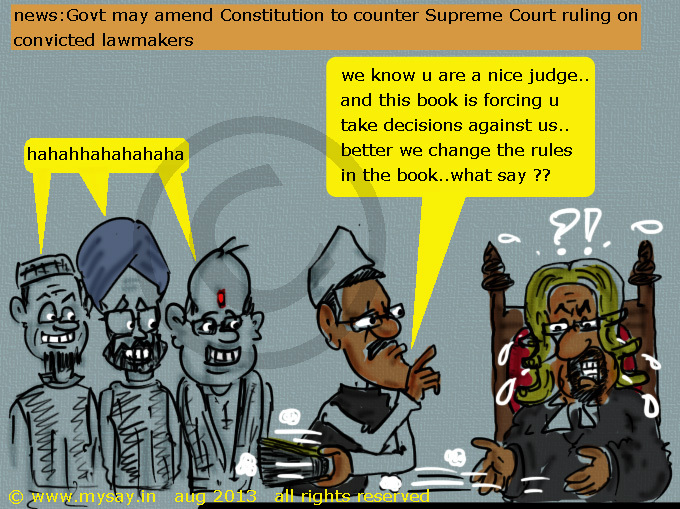 This will happen soon, in fact this might be the fastest change ever in Indian Law/Constitution. The depths that these politicians can plumb!! true .. to dig out reaches 🙁 at any cost !! The Hon’ble SC ruling comes late. The Constitution disallows convicts to contest elections…but Consitution ????? What?????Who????? I thinks before bringing in the instant amendment or any change in the Constitution, for that matter, they should conduct a plebiscite to collect public opinion on popular acceptance of the issue, i.e. the amendment. Let’s just burn every thing and anything which hurts our politicians sentiments, let’s sack every honest officer who challenges a politician. Our job is to make their life easy not the other way round. glad you liked it 🙂 why to have laws at all 😀 ? By the way, I still hope that with the power of arguments, Supreme court can bring some thing else – a check and balance system. Democracy is a balance between Judiciary , politics and army !! so far ..politics is the head .. as it is meant to be .. but when politicians go out of track for several decades … judiciary and/or military may try taking over .. like many countries !